Truth, it turns out, is Kim Severson’s bag. In her wonderful new memoir, Spoon Fed (which is out today), Kim spends 242 pages telling the truth. Sometimes it’s painful to read (Kim was such a severe alcoholic, she almost died), sometimes it’s hilarious (don’t miss the scene at Christmas when Kim’s father asks her gay brother’s Muslim boyfriend why his people like to crash planes into buildings), but mostly it’s thoughtful, instructive and deeply moving. 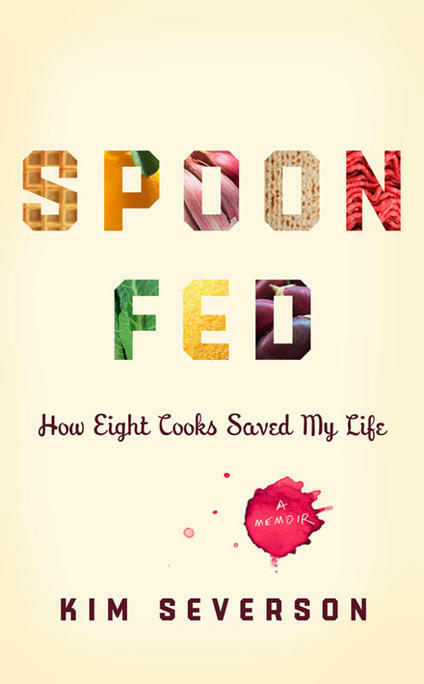 This is a book that really goes for it, digging deep into Kim’s own psychology as she lays out the ways that food (whether cooked by her or cooked by others) saved her life. It’s a story that many of us, who spend our lives devoted to cooking and eating, will relate to. What makes this particular story unique is Kim’s voice itself; I don’t think there’s another one quite like it—how many food writers can you name who’ve played in a community softball league, drove a black and teal Daihatsu SUV and have Rachel Ray’s phone number stored in their cells? Her mixture of humor, heart and honesty make her words both compelling and immensely readable. My favorite chapters were the ones where all of Kim’s natural story-telling gifts coalesced into a meaningful whole. Take, for example, the chapter: “God Loves You and You Can’t Do a Thing About It.” Here, Kim combines her skills as a journalist (describing the devastation after Hurricane Katrina) with her talent as a humorist (using wit and self-deprecation to justify the fact that she prays every day) in order to juxtapose her own questions about faith and family and the universe with the certainty and the serenity of Leah Chase, proprietress of the famous Dooky Chase in New Orleans. Or, perhaps even more profoundly, the chapter about Scott Peacock and Edna Lewis (“Blood and Water”)–the most remarkable duo, I think, ever to collaborate in a kitchen (he, a young, gay white man, she the older, celebrated African-American chef, the daughter of slaves); a story that I first read about in a wonderful article Kim wrote for The New York Times. Here, she takes the story even further, bringing us with her behind the scenes on that trip to Atlanta when she met the suspicious-at-first Scott Peacock and the ailing Edna Lewis. The way that Kim finesses their story and her own story of coming out of the closet to her parents is pretty masterful. It was, for obvious reasons, my favorite chapter in the book. Overall, there’s a lot to love about “Spoon Fed,” but the thing that I’ll take away the most is the lesson that Kim taught me on the phone: the importance of truth telling. It’s terrifying, sometimes, when writing to tell the absolute truth. Feelings may get hurt, relationships both personal and professional may be compromised (see, for example, the chapter on Marcella Hazan), you may, despite your best intentions, embarrass yourself. But what Kim proves in these pages is that the costs of telling the truth never outweigh the benefits; that being open and being honest isn’t just healing, it’s the difference between drinking your sorrows away in a dark room somewhere in Alaska and living the life of a fabulous food writer in New York. In other words, it’s what set Kim Severson free. As for the blender? I’ll tell you the truth: I really do love it.